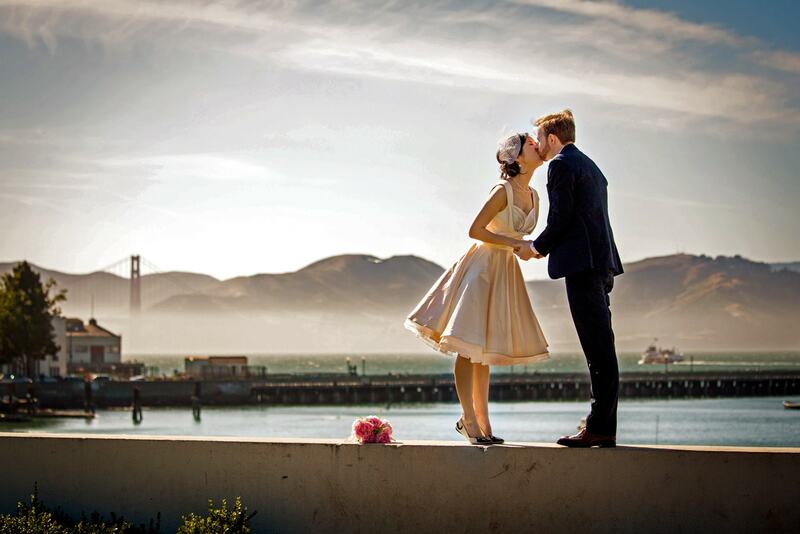 If you’re a bride-to-be, San Francisco is one of the best places in California to elope. It’s easy to see why getting married in San Francisco has gained popularity in recent years. Perhaps it’s because of the proximity to the natural beauty of the ocean and rich architectural history. Or maybe it’s the bounty of places to tie the knot, your way. Your San Francisco elopement will be a memory you’ll treasure for the rest of your life. There are plenty of San Francisco elopement packages that include famous landmarks, hotels, and destinations. Many of these packages are all-inclusive so you don’t have to worry about a thing other than saying “I do”. A quick internet search is all you need to pull up venues for every taste and budget. You’re sure to find several options within your price range and that reflect what you want to represent you and your romantic union. Nature itself takes the spotlight here. Couples who want to be totally on their own can find any number of places dotted along San Francisco’s famous Bay Area to tie the knot. Some opt to venture out into the stately redwood forests of the region to say their vows in these pristine ancient forests. For couples who choose a more formal approach to their marriage, there are plenty of places that offer San Francisco elopement packages. None, however, can quite rival the architectural majesty, history, and convenience of San Francisco City Hall: www.chocostudio.com/city-hall/. There is a reason that San Francisco is the last word in the best places in California to elope. There are so many choices for your special day and here are just a few things to consider when choosing your venue. What’s The Weather: This is especially important if you’re choosing an outdoor venue. Weather in San Francisco can sometimes be unpredictable and the last thing you want is to be saying your vows while drenched in rain. Is It All Inclusive: Some venues have a basic package that they offer for a fixed price, but little add-ons are extra and can add up fast. Always get clarity. How’s The Lighting: This might not have crossed your mind, but it’s really something you should consider. For your wedding pictures to pop, you need some great light. Will I Need An Officiant: Weddings are legal ceremonies, so you’ll need someone there who can legally tie the knot for you. Even the most private ceremonies need legal documentation. Who Will Be My Witness: When getting married in San Francisco, and anywhere else in the country, you need a witness to stand up for you. Eloping is no exception. Am I Combining This With My Honeymoon: Some venues offer luxurious stays of several nights. If you’re looking to combine your wedding day with your honeymoon, this might be a good consideration. There are plenty of venues dotted all over San Francisco that cater to most budgets, styles, and tastes. Most people opt to elope at the elegant City Hall. When it comes to venues, it’s tough to beat San Francisco’s iconic City Hall. It’s a famously beautiful historical landmark that occupies two whole city blocks and attracts visitors from all over the world. They have a number of different elopement packages for all budgets and have conducted thousands of lovely weddings. If you opt to get married at San Francisco’s City Hall, you’ll find the process to be easy and straightforward. They have officiants on hand to conduct the ceremony and you can get your marriage license right there. You just need to bring one witness to stand up for you. Easy! The attendants at San Francisco City Hall have vows available for use, or you can read original ones. They perform both religious and non-denominational ceremonies and you can customize it to suit your unique tastes. Additionally, San Francisco’s City Hall is a great place to take wedding photos. An architectural masterpiece that echoes decades past, it’s flooded with natural light and awe-inspiring backdrops. The photos of your special day will be unforgettable mementos that you’ll cherish for years to come. Check The Venue: Make sure it’s available, doublecheck any additional costs and decide how lavish you want your ceremony to be. Decide On The Ceremony Details: Will it be non-denominational, secular, or religious- or anything you want that’s in between? Book Your Pampering: Find a spa you like and book an appointment to get beautified before the big day. Book in advance so they have plenty of time to ensure that you look your best. Especially if you’re having multiple treatments or something that will take a long time, like getting your hair colored. Book Your Rooms: Make sure rooms are booked for any additional guests or more nights you’d like to stay. It’s always better to try to book everyone at the same hotel for ease of coordination. Get The Legalities Taken Care Of: Discuss any thorny issues like Wedding Agreements and if either of you will change your last name. Now is the time to do it, even if it means having a serious conversation. You’re better off being on the same page now, rather than finding out later that you made dangerous assumptions. Write Your Vows: If you have a little something special to say, now is the time to commit it to writing. Many couples opt to write personal vows declaring their love for each other. These can be a poem, a favorite saying, or simply a sentimental note. If you’re planning on getting married in San Francisco, you’ve made a great choice. Couples considering a San Francisco Elopement will find unparalleled natural beauty, stunning architecture and a city that’s made for romance. Get in touch to learn more about having us photograph your San Francisco Elopement.